New Living Room Furniture for the 2019 Season includes 5 reclining seats and more (not yet pictured). 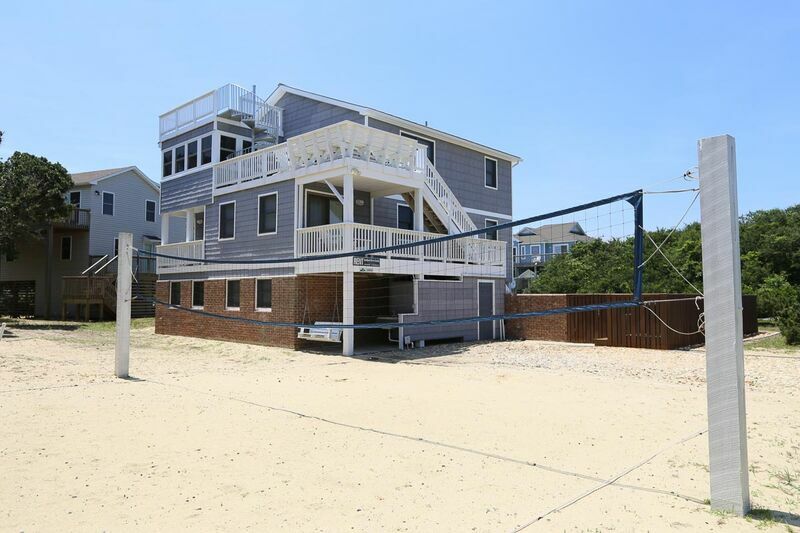 Make wonderful vacation memories in this perfect vacation retreat offering spaciousness, privacy, and total comfort. A short stroll leads you to the ocean (no main thoroughfare to cross), sound, or the shops and restaurants in Duck. For 2018, kitchen and sunroom renovation, new 7-person hot tub, all new appliances, cabinetry, and flooring. PLUS…new and upgraded King and Queen Mattresses in 2018. Bedroom (with Twins); full bath (with shower); 18' x 30' recreation room, 55" HDTV/Blu-ray player, stereo system, extra ceiling speakers; outdoor speakers for poolside enjoyment, poolside half bath. 4 bedrooms (master bedroom with King, bath with shower, and private deck; master bedroom with Queen, bath with tub & shower, and private deck; 1 with Pyramid bunk; 1 with Pyramid bunk and Bunk set); full hall bath (with tub & shower); laundry; foyer with seating. Great room with 51” LED HDTV/Blu-ray player with surround sound; decking with built-in seating, fully equipped/renovated kitchen with new beverage/wine cooler; updated sunroom; Dining table extends to seat 10. Seating for 16 provided in dining area and sunroom; powder room; master bedroom (with King), private bath (with double vanity and tiled shower). Sundeck with spiral staircase access. 51” HDTV/Blu-ray player with surround sound in great room. 55" HD/Blu-ray player in recreation room.